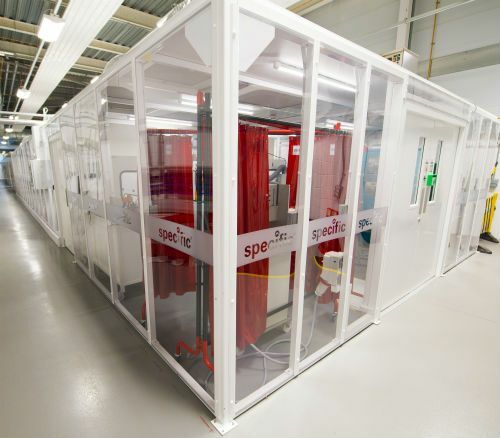 Connect 2 Cleanrooms have completed the installation of an ISO Class 6 & 7 cleanroom at Swansea University to help support their solar cell research as part of the SPECIFIC Innovation and Knowledge Centre. Led by Swansea University, SPECIFIC is an academic and industrial consortium with a vision to turn buildings into power stations. The solar photovoltaics research is developing materials and manufacturing methods to produce solar cells on glass and steel construction materials. These materials will replace conventional roofing, cladding, and glazing products, so buildings can generate a significant proportion of their electricity demand from the fabric of the building alone. Following the construction of brand new state of the art laboratories on Swansea University’s Bay Campus, SPECIFIC required a cleanroom to provide a stable and consistent environment for their research, as well as a larger space to co-locate all of their solar cell activity. SPECIFIC’s extremely tight specification required temperature control to maintain 21 °C very reliably, and humidity control to be less than 30% relative humidity at all times. Following on from previous working relationships with the Swansea University, Connect 2 Cleanrooms designed, manufactured and installed a Modular Hardwall panel system on the new Bay Campus in Swansea. With an overall footprint of 114 m², the suite of cleanrooms consists of 4 rooms. The humidity controlled room is 6 m x 4 m, ISO class 7, temperature controlled to maintain 21 °C, and can deliver a constant humidity level of less than 30% at all times. The ISO Class 6 area is at the other end of the cleanroom, it is also 6m x 4m and is temperature controlled to maintain 21 °C. The main cleanroom area is 11m x 6m, ISO Class 7; temperature controlled to the same level as the other rooms, and houses three gloveboxes for research requiring an oxygen-free atmosphere. The final room is the change area which is ISO Class 7, and allows operators to gown up in a controlled area, minimising the introduction of particles into the room. The cleanroom design incorporates a mixture of swing doors and sliding doors to aid flow of materials and personnel into and out of the cleanroom, entry is controlled by swipe cards to restrict access, and the SPECIFIC logos on the outer panels personalise the room and add to the aesthetics of the design. The transparent hardwall panels to two walls allow visitors an unobstructed view of the facilities and equipment without impacting upon the research, or cleanliness of the room. All these design elements ensure that the cleanroom not only meets the essential parts of the client’s specification, but also aid the practical usability of the cleanroom. The inclusion of the humidity and temperature control ensures invaluable consistency all year round. The Connect 2 Cleanrooms control system provides SPECIFIC with the ability to regulate humidity and provides a consistent environment in which to investigate issues, during material synthesis or manufacture, enabling them to develop a more stable baseline for materials and processes. Prior to the installation of the cleanroom, the laboratory was achieving 30%-70% relative humidity; however, where the relative humidity was too high the devices wouldn’t work. More information on Connect 2 Cleanrooms’ modular cleanrooms can be found at www.connect2cleanrooms.com.